Aino, Janne and Tale in Satula. 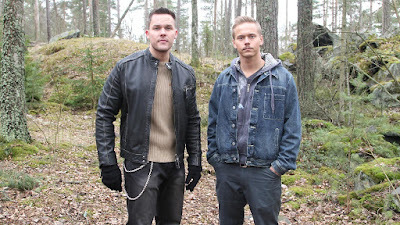 Ronny Roslöf and Petteri Paavola. Satula seems to be some kind of virtual reality or dreamworld where all the pople are exact copies of people in Salatut Elämät. For example, the copies of Lari and Elias, real hillbillies, are called Kristoffer and Pauli, and they seem to be real homophobes. And Petteri has a moustache! And also, Kari Taalasmaa, who is a real homophobe in SE, his copy in Satula is gay! I already love it, after just four episodes. There is going to be 20 episodes which airs online on tuesdays and thursdays. 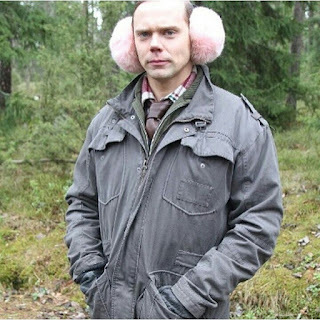 MissFinlandia88 puts the episodes on youtube when she has time. And that is great, because I still don't know any Finnish! And we might also have this to look forward to. If it's not off the screen, but why would Pete Lattu have ginormous earmuffs off screen? He is really cute though! And I am so curious of what character he plays, cause I guess it's not Kalle Laitela! So do watch Satula, it really seems to be great fun! A blog about all the DramaQueerz in soap operas around the world. Gay characters that's not getting the attention they deserve. flightsofstars: Can you describe Malec in three emojis? Sodomi - det är svårt att låta bli!